On February 6, 2014, Canada’s Citizenship and Immigration Minister Chris Alexander unveiled the first comprehensive reforms to the Citizenship Act since 1977. With the unveiling of Bill C-24, the Strengthening of Canadian Citizenship Act, the Canadian Government purports that the new Bill will protect the value of Canadian citizenship while creating a faster and more efficient Citizenship process for those immigrants who have applied to become a Canadian citizen. Soon to be Canadians come together for the Citizenship Oath Ceremony. Bill C-24 introduces some key changes to the way in which newcomers become citizens. Newcomers will be expected to show that they have established strong ties to Canada and residence requirements will ensure that the applicant has resided physically in Canada for the duration that is specified in the Act (physical presence of 4 out of 6 years or 1,460 days) with a signed declaration of “intent to reside” in Canada. Permanent Residents will be required to be present in Canada for 183 days each year for four out of six years. Under the new system, there will be one step instead of three and applicants can expect a decision to be made within a year. Changes and measures that will be put into place are expected to reduce the backlog of applicants by 80% and streamline the process to be more simple and efficient. 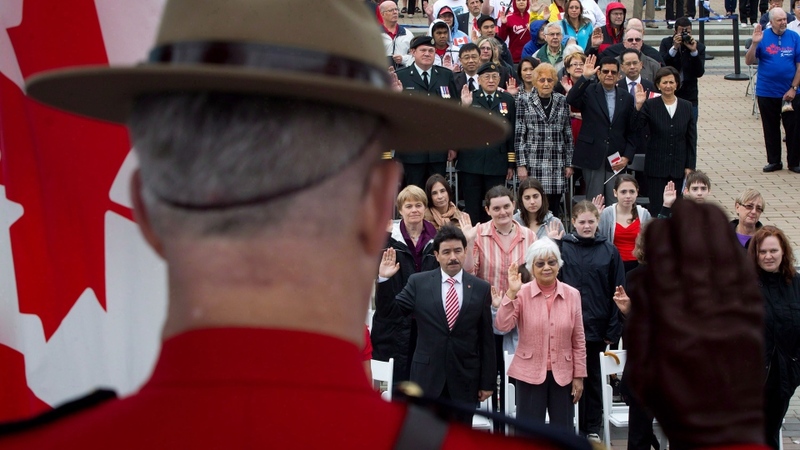 Citizenship will automatically be extended to those with strong ties to Canada who were born before 1947 and their children born in the first generation outside of Canada (“Lost Canadians”). More language requirements will be implemented as well as having to pass a knowledge test. Support for studying for these two requirements can be found at local immigrant settlement services agencies across Canada. Many have online systems that can help new immigrants study for the exams, and there’s even an app that can be downloaded here. Fees for Canadian Citizenship will be expected to rise, as the cost that is normally associated with Tax Payers footing the bill will be alleviated. Application fees will then reflect actual costs associated with becoming a citizen of Canada. As well, the Government intends to implement stronger measures to protect Canada against citizenship fraud, and will be imposing harsher penalties for misrepresentation (max $100,000 or 5 years). Under the current system, a Permanent Resident of Canada must live in Canada for three out of four years to be eligible to apply for Citizenship. Under the proposed new changes, that four year period of waiting will be increased to four out of six years and will eliminate any temporary visa period when calculating time spent in Canada. The old system was a three-step process whereby a Citizenship Officer prepared applications for citizenship to be presented to a judge and then accepted or rejected. In the new system, the Citizenship Officer will be able to make a decision on citizenship on behalf of the Minister. This one-step process is considered a way of reducing red-tape and speeding up the process for obtaining citizenship. As of February 6, 2014, the fee for Canadian citizenship for adult applications for a grant of citizenship, resumptions and adult adoptions increased from $100 to $300. The tax savings on Citizenship costs will be passed on to Canadian citizens with new immigrants picking up the tab for the actual costs of processing. The $100 Right of Citizenship Fee remains the same for successful applicants. Fees for applications for a grant or resumption of citizenship for a minor child of a Canadian citizen are exempt from this change. Previously, new immigrants only paid 20% of the cost of obtaining Canadian Citizenship and will now be responsible for shouldering the entire cost of the process rather than a shared structure supported by tax dollars. As Canada has had the highest level of immigration worldwide, resources in Citizenship have not been enough to sustain the level of applications for Citizenship and so these changes will help minimize the Citizenship backlog that tends to develop from over demand. Under the old system, the Governor in Council could under certain circumstances of hardship or as a reward of an exceptional value to Canada, direct the Minister to grant Citizenship. Under the new proposed changes, the GIC no longer has this power and the discretion will fall completely under the current CIC Minister of Citizenship & Immigration. Under the new proposed changes, access to the higher courts would be given to all applicants. Currently, an appeal of a judge’s decision can go to the Federal Court only (and cannot go to Supreme Court). As well any decisions made by Citizenship Officers who have the authority to decide on Citizenship can be open to judicial review and challenged in a higher court. Proposed changes would give access to higher courts for all applicants. CIC proposes to amend the review process for decisions on citizenship applications. Currently, an appeal of a citizenship judge’s decision can go to the Federal Court (FC) but no higher. Decisions by citizenship officers, who have authority to decide certain cases under the Act, can be judicially reviewed and challenged in a higher court. Under a uniform review system, any decision under the Citizenship Act can be appealed as high as the Supreme Court of Canada (Canada’s highest court of appeal). Under the current system, a citizenship certificate must be issued to each person, denoting Canadian Citizenship as proof. The new proposed changes want to move to a more flexible system of proof whereby rather than a paper copy, Citizens can prove they are Canadian citizens through electronic means. Under the current Citizenship Act, there is no authority to abandon a citizenship application, especially in situations where an applicant has failed to appear for the citizenship test or an appointment with a Citizenship Officer. CIC would like new powers of authority to determine if it is appropriate that an application be abandoned if there is a ground of non-compliance or misrepresentation by the applicant. This new power of abandonment would apply to all Citizenship applications under the new Act at any stage of processing until the oath is taken. Incomplete applications can be returned to the applicant. Minister Alexander was quoted in saying that “The Strengthening Canadian Citizenship Act, along with the launch of the Blueprint for Citizenship Improvements, helps improve the citizenship process by reducing backlogs and wait times. Our government is proud to table improvements to the Citizenship Act that reinforce the value of citizenship and make the process quicker and easier for new Canadians who play by the rules.” Chris Alexander, Canada’s Citizenship and Immigration Minister. Finally, it should be noted that a new designated body of authorized representatives will be able to give advice on Citizenship matters. And for immigration clients, this will be an important part of the process to becoming a citizen of Canada. It will be important to have a trusted advisor that can guide the citizenship process for you and represent you in the event that a Citizenship Officer denies your application for Canadian citizenship. This person can help to give the very best advice and assistance on preparing your application. For new immigrants and permanent residents, it will be vital to begin the Citizenship process as soon as they are able to apply, and to follow the new rules as outlined in the new Citizenship Act. Activities such as developing language skills, establishing strong ties to Canada through networking, paying taxes by filing with Revenue Canada so that there is a record and ensuring to meet all residency requirements while in Canada will be critical to the success at becoming a Canadian citizen. This entry was posted in Canada News, Canadian Citizenship, canadian immigration, Citizenship and Immigration Canada, citizenship test, CLB and tagged Citizenship and Immigration Canada, Minister of Citizenship and Immigration, Toronto, Vancouver. Bookmark the permalink. I landed here in Winnipeg, Manitoba last Oct. 6, 2010, Am I included in the Bill C-24 (physical presence of 4 out of 6 years or 1,460 days)? Is it clear when the new process will be implemented, everyone mentioned different dates but they are predicting. Does anyone has clear answer on that? How long will it take after submission to the CIC to hear from CIC in the submitted application at Nova Scotia?